It’s not one of those awards I can pass on, obviously, but on the plus side I don’t have to jolly you to read about seven personal habits you never knew I had. Indeed I’ll be a bit quieter than usual until June as I won’t be in grasping distance of a mouse. The Undercover Soundtrack is taking a break too, and will be back on 6/6. In the meantime I’ve scheduled a rerun of Undercover Soundtrack highlights which you can catch if you follow @ByRozMorris on Twitter, and I’ve prepared a stack of useful writing links to share on @DirtyWhiteCandy. You can also see them streamed here in the ever-growing sidebar (which, yes, I must get round to trimming). Happy writing, see you soon – and thank you, Writer’s Digest! This entry was posted on May 24, 2012, 6:07 pm and is filed under How to write a book. You can follow any responses to this entry through RSS 2.0. You can leave a response, or trackback from your own site. Yep, you totally deserve this, Roz. You’ve got great original content and you know I love how you present it /and/ yourself. Congratulations! You deserve the kudos. I hope you enjoy your holiday. Woot! 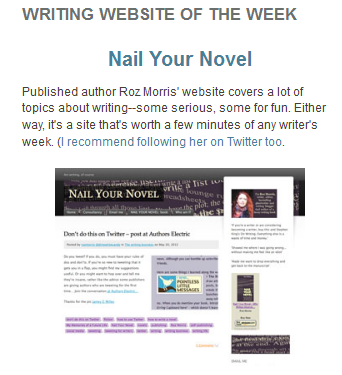 Well done, and keep blogging!!! Oodles of congratulations and good wishes for the future! Congrats Roz – and enjoy the break. Congratulations! Its great when good things just come at you out of the blue – well deserved!